The euphoria about the defeat of epidemics which surrounded the global eradication of smallpox in the 1970s proved short-lived. The advent of AIDS in the following decade, the widening spectrum of other newly-emergent diseases (from Ebola to Hanta virus), and the resurgence of old diseases such as tuberculosis and malaria all suggest that the threat of epidemic diseases remains at an historic high. The World Atlas of Epidemic Diseases provides a timely and scholarly review of over fifty of the most important such diseases at the start of the twenty-first century. This stunningly presented collection of maps, illustrations and commentary offers an authoritative overview of the global distribution of major epidemic diseases on a variety of spatial scales from the local to the global. The Atlas is arranged in an historical sequence, beginning with classic plagues such as the ‘Black Death’ and cholera and moving on through smallpox and measles to ‘modern’ diseases such as AIDS and Legionnaires’ disease. Over 400 figures are incorporated, including 150 specially drawn maps supported by micrographs of the causative agents, photographs of the disease vectors, historical prints and graphs of changing incidence. 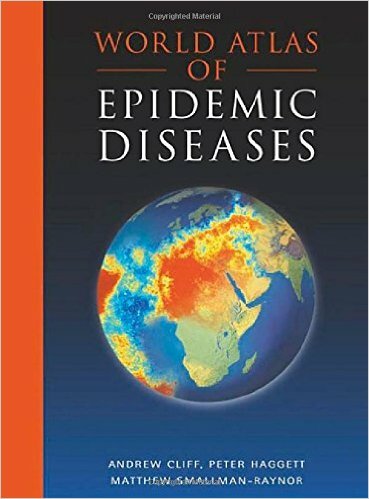 The text for each disease includes discussion of its nature and epidemiological features, its origin (where known) and historical impacts, and its global status at the start of the twenty-first century. The book concludes with an informed look towards the future, assessing the probable impacts of major medical advances on life expectancy and the chances of success of programmes for the global eradication of diseases such as polio and measles. The World Atlas of Epidemic Diseases makes a major new contribution to our knowledge of the global burden of disease and is an informative and fascinating reference on the changing distributions of disease. It will be an invaluable resource for anyone interested in the spread, control and eradication of epidemic disease.